5th and Madison is a LEED certified project just a few blocks south of Seattle’s Retail district. The aesthetically gifted tower boasts a built green lifestyle and has delivered on its promise. Designed by architects Ruffcorn Mott Hinthorne Stine the sleek luminous tower includes many amenities for its residents such as a garden terrace and lounge, library, fitness center and studio, guest rooms, pet exercise area, controlled access parking and 24 hour concierge. In addition to its amenities its located in the heart of Seattle’s financial district offering plenty of shopping, entertainment, great walk-ability and a close proximity to the major thoroughfares.5th and Madison is unique in that all of the units, except the three penthouses, are one-bedroom or one-bedroom + den layouts, ranging in size from 808 to 1,244 square feet. The two-and three-bedroom penthouses range from 1,957 to 2,164 square feet in size. Touted as one of the top 10 green built buildings in America, Turner Construction turned 5th and Madison into a lean and mean environmental marvel. This high-rise is one of the first in the country to obtain a Gold Standard LEED certification for it’s leadership in environmental design. 5th and Madison has done a lot of things right. 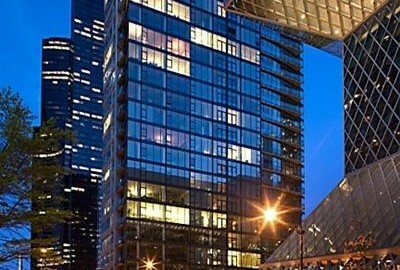 Its remarkable transparent exterior, amenity package, gorgeous interiors and environmental conscious design, has put it on the Seattle map for many buyers to consider.